In Cuba, the doctors and nurses who went to West Africa to combat the Ebola outbreak are being considered for the Nobel Peace Prize. CCTV America’s Michelle Begue reported this story from Havana. Cuban doctors and patients were happy to hear the news that some of their own would be considered a candidate for the Nobel Peace Prize. “I think it is a recognition not only for those that are working abroad, but also for all of us, as they represent us. It would be good for them to receive the nomination,” a physician with the surname Lilia said, who did not give a full name. The medic team, known as the Henry Reeve brigade, was named for a U.S. doctor who joined the Cubans in the 19th century War of Independence. The brigade was created in 2005 by former Cuban leader Fidel Castro. “They work in very hostile situation. That is why there is so much merit in what they do. They give of themselves without asking for anything,” said a physician surnamed Pablo, who also did not give a full name. The team’s first missions were in Guatemala for a hurricane, and Pakistan for a devastating earthquake. Officials said they have sent 461 doctors and nurses to help fight the Ebola epidemic in West Africa that has killed almost 9,000 and infected more than 22,000 according to the World Health Organization. “Every Cuban doctor deserves it, because all of them have gone to big missions and have done a great job,” a patient from Cuba, Milagros Betancourt, said. For medical students studying in Cuba, the recognition has been motivational. “They are helping Cuba’s international reputation. 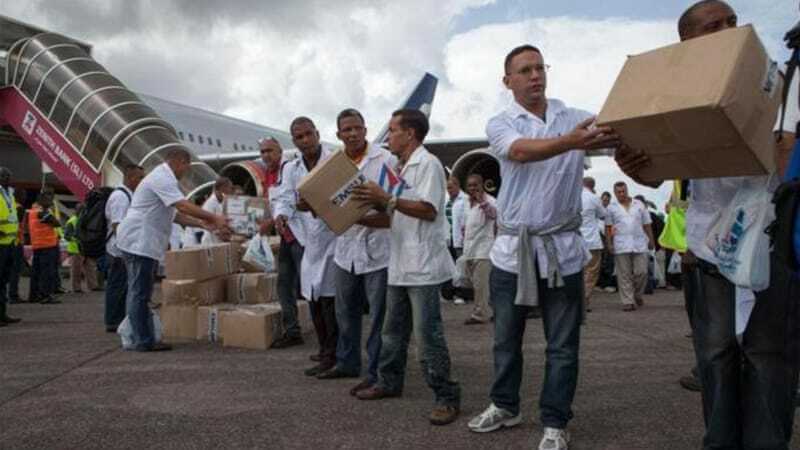 Those doctors, of the Henry Reeve Brigade, are combating Ebola, despite their fears as it is highly contagious,” Efren Santan, a Cuban medical student said. Andrea Enriquez, a Guatemalan medical student said the nomination validates her decision to study in Cuba. “As a foreigner in this country, to study medicine and to hear that news, this tells me that I made the right choice in coming to this country to study medicine,” Enriquez said.